Yomega - Entry Level Fixed Axle Yo-Yo! 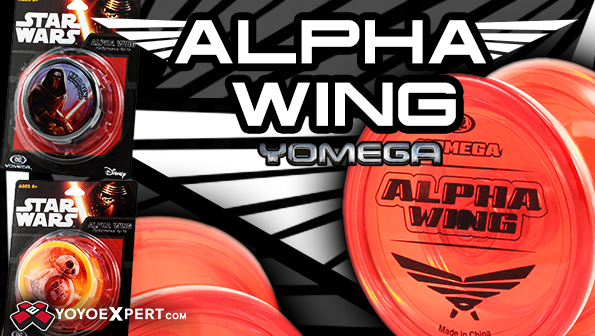 The latest addition to the excellent beginner yo-yo lineup form Yomega is the all new Alpha Wing! The Alpha Wing is a super fun low maintenance fixed axle yo-yo designed for beginner string trick play and fixed axle enthusiasts! It has a nice high wall design that really helps with regens and stalls along with a flared string gap that gives you an extra edge with string tricks. This durable plastic yo-yo uses a fixed steel axle and starburst response that really doesn't require any maintenance and is compatible with cotton or polyester string. It is not a take apart yo-yo, so don't try to untwist it and make sure you have a paperclip handy to get out knots. The Alpha Wing is Perfect for new players learning basic string tricks or fixed axle fanatics looking for a durable new throw!